For those who want the details, here is Lucy's entrance to the world. After dinner on Thursday, October 9, Jon and I brought Gus over to our neighbor's house to spend the night. After we were sure that Gus was asleep and not going to give our neighbors any bed time problems, we walked back to our house and tried to sleep. I can't say how Jon slept, but I didn't sleep very well. Along with the nerves of being induced (we've all heard horror stories), I had the added fears of thinking she would die during birth. Jon and I arrived at the hospital at 6:45am, got checked in with registration and headed up to Labor & Delivery. As we were walking through the doors, we saw our doctor. We got put into our room, I got changed into a hospital gown and the day's events began. I first got into the bed at 7:03am and the NST started at 7:07am. At 7:17am my doctor came into do a cervical check; I had not progressed any since my appointment on Monday, so I was still at 5cm and 80%. At 7:40am the IV antibiotics for GBS began and the pitocin was started at 7:48am at a dose of 1mU/min. Over the next 4.5 hours I was allowed to take walks around the hallways, but the nurse always told us what time I needed to be back in the room so that I could get back on the monitors so that they could have an accurate picture of what was happening with my contractions and Lucy's heart rate so that they could adjust the dosage of the pitocin. So, Jon, my IV pole and I would go for laps around the hall. During one walk, I'm not sure what time, Jon overheard the nurses at the desk comment that they were surprised I was up and walking around when I was having contractions every 3 minutes. This was just more confirmation to me that I have a different pain tolerance than most people. Yes, I could feel that I was having contractions, but I could definitely walk and talk through them. At 11:40am, my pitocin got upped to 5mU/min, and I could tell that things were moving along as I could begin to feel some rectal pressure. My doctor came in at 12:16pm for a cervical check and I was at 8cm and 90%. He then broke my water and the contractions changed. I now needed to breathe though them and I had no interest in getting out of that bed. In hindsight, I began to ignore the goings on of the room around me. My response to pain is to go to my happy place, so I think I was beginning to prepare for delivery. At 12:45pm I began pushing. I don't know how long I was pushing for, but at one point my doctor told me, after one contraction, that I should rest on the next contraction so that I could have more strength/energy/efficiency for the contraction that followed. Apparently I liked that idea, so that's what I did for the remainder of delivery. Jon told me that I'd have a contraction, during which I'd push, then it would be 5min until the next contraction, but I'd use that as my break, then we'd have to wait 5 more minutes for the next contraction for more pushing. Apparently, this somewhat annoyed the doctor, especially since he wanted me to push, but I would tell him that it was my break. I recall the doctor telling the nurse to adjust the pitocin during this time, and it was probably to get my contractions closer together so that Lucy would finally be born! I remember the doctor saying that she had lots of hair, and asking us if we were sure that we didn't want to call her Harriet. I remember asking Jon if we were making progress. I, obviously, knew she wasn't born yet, and having no idea of how long I'd been pushing, I just wanted to know that during the pushes she was getting closer and closer to being born. 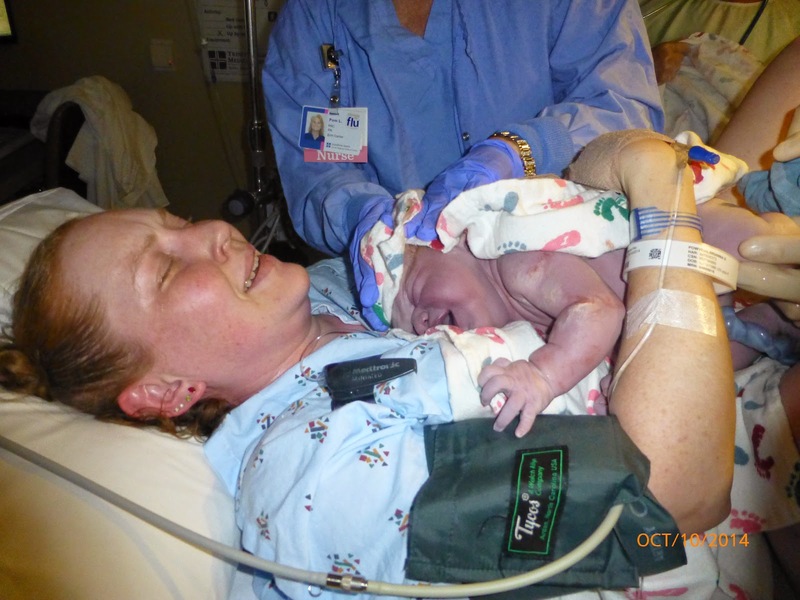 Finally, at 1:28pm, Lucy was born. She was placed on my abdomen, but there was no HUGE cry. She was making sounds, but not the scream that everyone hopes for. This began to worry me some, but eventually she let out a big scream. After she spent some time on me (not sure how long), Lucy was taken to be weighed and measured. She was 8lbs 4.75oz and 19.5in of beautiful. I don't recall this at all, but I must have known she was going to be born because I asked Jon if he had the camera ready. I'm so glad he did, otherwise he would not have gotten Lucy's very first picture...not even 1 minute old. Aw first picture, how precious! LOVE that picture at the end. Beautiful.